Paintball Minnesota paintball centers and fields introduce the new and improved way to play paintball for kids and adults! All of our paintball facilities now specialize in low impact paintball equipment. The paintballs are smaller, lighter and more fragile than the traditional .68 caliber paintball. These specific paint balls deliver less sting upon impact making the experience more fun for everyone! 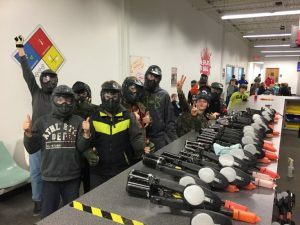 Low impact paintball has evolved into one of the most commonly requested party ideas in MN. Both the rental gear and paintballs are lighter, smaller and more fun to play with. Experience paintball the way it was intended…FUN! Our paintball experience won’t leave you with massive welts and large bruises! Feel the rush of traditional paintball with less pain! A low impact paintball fired at the traditional speed has approximately a third of the impact force of a traditional paintball fired. Low impact paintballs break at a slower speed thus making the sting 68% less than your average paintball. Ultimately, our paint balls lessen the “ouch factor.” Our special paintballs are also non toxic and wash out of your clothing unlike many outdoor paintballs. Low impact paintball is super fun for all ages but don’t fall for the “low impact paintball” advertised at other paintball fields in MN. They use cheap spring loaded plastic guns. These plastic pump guns commonly jam up and break paintballs in the gun before you even shoot. Paintball MN is the only company that deploys true low impact paintball with modern semi-automatic guns. Every one of our guns is battle tested and maintained by the only certified Planet Eclipse Technician in the area. Play paintball today without losing the traditional fast paced, adrenaline pumping action. It is our mission to provide our customers with the safest and best paintball experience in Minnesota! Paintball Minnesota was the first company to adopt the new technology in the Midwest! Our affiliate locations put a twist on traditional paintball! The enhanced paintball experience at isn’t just due to upgraded facilities, playing areas or staff. The overall paintball experience is now perfect for kids and adults! The modern game of paintball has evolved into one of the funnest party ideas in MN. Until recently, paintball has most commonly been associated with being painful and leaving unwanted bruises and welts. Now with the incorporation low impact paintball guns both kids and adults can now enjoy paintball the way it was intended! Low impact paintballs are (.50 inches in diameter) smaller, lighter and more fragile than the traditional (.68 caliber) paintball. These specific paintballs deliver less sting upon impact making the experience more fun! 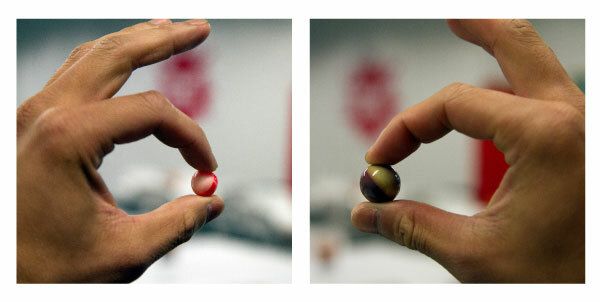 A .68 caliber paintball weighs 3.00 grams. A .50 caliber paintball weighs only 1.25 grams (approximately the weight of a paperclip). Does Low Impact Paintball Hurt? The low impact format takes a majority of the pain out of paintball impact by reducing the weight, size and structure of the paintball. In fact, the the weight is cut by 60% and by .18 inches in size. By reducing the overall mass of the paintball the player feels a lot less of a sting compared to the standard (classic) paintball. How much less of an impact will you feel? The weight of the paintball is not the only factor that determines the amount of sting felt. The speed or velocity of the paintball is another important factor. Less Ouch – More FUN! The data is striking (literally)! The low impact paintball format is less than a third of the impact of the traditional paintball commonly used at other paintball fields. Best of all, that 2.68 ft lbs of force is the amount of force the ball has when it leaves the barrel of the paintball gun. We don’t allow players to shoot one another that close. Most shots occur at a distance, which means you’ll feel even less of an impact when you’re hit.